This document describes how you can test that your installation of Macrobond is working. This document refers to Macrobond 1.10. and later. Check that Macrobond is available in the start menu. By default it is found in “Macrobond Financial/Macrobond”. Start Macrobond from the Start menu. If no user account has been configured, which is typically the case during a new installation, you will be prompted for a user name and password. Fill in the user name and password. Please note that if you enter a user name and password and successfully log in, that user account will be associated with the current Windows user profile on the computer. 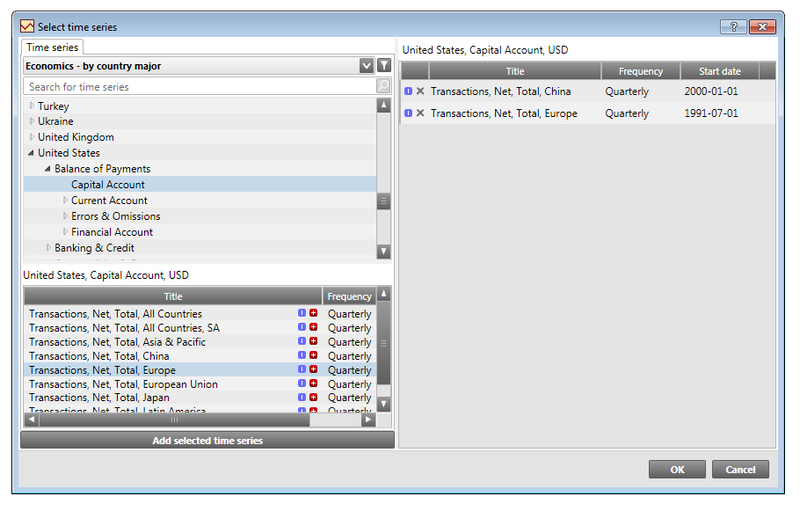 You then need to contact Macrobond support in order to use that user account with another user profile or on another computer. If you come this far without any errors it means that you have access to the Macrobond servers and that your credentials are correct. The first time the application is started, it will download something called the “attribute database”, and this may take 10-60s depending on your internet connection. During this time you will see a text at the status bar of the bottom of the application. During this time you will get an “hour glass” if you try to access some functions in the application. In order to create a chart, click on the tab Browse to the left of the application. Then select Overview, Major Countries and click on Denmark. You will then see that the list of Actions at the top of the application is updated. Click on the Action “CPI”. 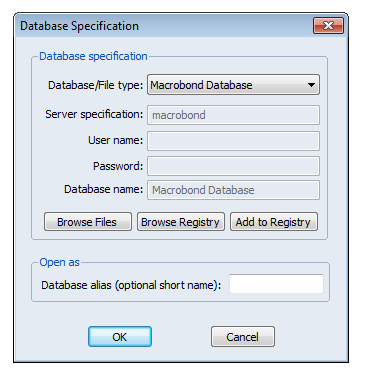 Test that documents can be saved locally and the Macrobond file type is correctly registered. With the chart open, select “File, Save as Analytics document”. Select “My computer” and enter a document name. The chart will now be saved to your local computer. Open Windows Explorer and navigate to “My Documents/Macrobond”. The name of the folder “My documents” may vary depending on the language of your Windows installation. You should find the file that you saved in this folder. Double click on the file and it should open up in Macrobond. Test that OLE integration with Office works properly. Select “Help, Getting started” in the Macrobond application. This should bring up your web browser to the Macrobond “Getting started” web page. This verifies that you have access to Macrobond web server. Select “Help, Check for update”. This will check if you have the latest version. You should either get a message that tells you that you have the latest version or tell you that there is a later version. You should not get any error messages. This verifies that the application has access to access to the web server www.macrobond.com. There should be a Macrobond tab or menu (older versions of Office). Currently only 32-bit versions of Office are supported. Select the “Macrobond/All series” command. This will bring up the dialog “Create time series data set”. This will search for such series in the database. Add the series “Production Sales, Turnover (...) X-12 ARIMA” to the data set by pressing the red + button. Macrobond 1.2.2 and later includes an add-in for EViews. For the add-in to work you need EViews 7.2 Enterprise Edition (Apr 29 2011 build) or later. Currently only the 32-bit version is supported. To open the database, just press OK in this dialog. You will then see a window that contains a number of buttons at the top. 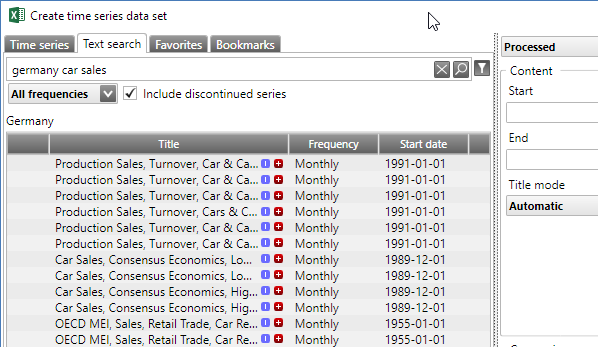 Press the Browse button and you will see a dialog where you can select series from the Macrobond database. Select a couple of series on random by pressing the red + next to the series. This should add the series to the right-hand side of the dialog. The Macrobond application can communication with the Bloomberg Terminal if it is installed and running on the same computer and retrieve historical time series. Please note that Bloomberg Anywhere cannot be used for this purpose. Then go to the Analytics Activity by clicking on the tab Analytics on the tab strip to the left of the application. Create a new document by selecting File|New in the menu. In the list of data sources you should now find a source called Bloomberg as shown in the picture below. Enter the Bloomberg symbol “ibm us” and press Enter. You should now see “International Business Machines Corp” in the list. Click on the red + next to the title and you should see a line added to the graph in the document to the right.